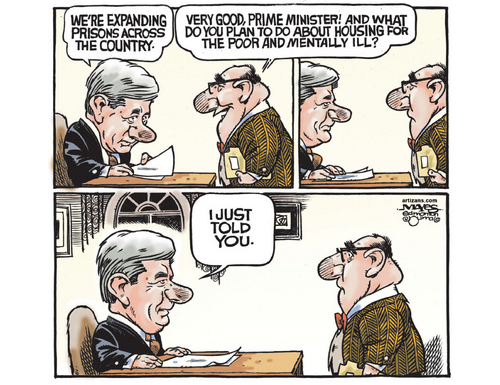 The Harper Government wants to create more Criminals. The total crime rate for serious offences fell by 19% between 2000 and 2010. The crime severity rate has fallen 6% since 1998, which means that Canadians commit fewer violent crimes like murders, attempted murders and serious assaults. There are also fewer brake-ins, car thefts, robberies and drunk driving charges — still Harper wants to spend massive amounts of our money locking up more Canadians. Crime rates in Canada have been falling steadily for over a decade yet Harper insists on spending our money to lock up our most vulnerable citizens like youth and aboriginals. Spending billions on bad crime laws means that our taxes will rise or valuable social programs like Employment Insurance will be cut. Quebec and Ontario have already said they won’t pay. This week, experts are speaking out against the massive crime bill that our Conservative government is rushing through Parliament.1 Even conservative Texans are warning Canada not to follow American’s failed path of mandatory sentences and massive prison expansion.2 Now, we need a massive public outcry to stop the bill, and make Canada safer, not meaner. The good news is that more and more Canadians are speaking out and public opinion is close to a decisive shift. The Conservatives want to be “Canada’s natural governing party” and they care about public opinion. We need to show the Conservative government that they can either choose a better path, or they will pay a serious political cost for making Canada a meaner and more dangerous place. Every billion dollars our federal government forces our provinces to spend on new prisons is a billion dollars that could have been spent preventing crimes by supporting programs for at-risk youth, drug and alcohol treatment programs, and strategies for mental health. The crime bill represents a creeping erosion of Canada’s social fabric. We know that millions of Canadians believe that prevention and restorative justice – approaches that make sure the victimâ€™s needs are met and the community is healed – should be the heart of Canadian justice. This crime bill would move us in the wrong direction. Who benefits from one-size-fits-all punishments? Who benefits from massive prison expansion? Who benefits from throwing more of Canadaâ€™s youth, poor, and mentally ill in prison? It’s time we speak out together. This petition is an essential first step in a major campaign. Will you join us? Both only take a minute of your life to sign.. Please do pass this on. The cartoon is by Malcolm Mayes, in the Edmonton Journal. The Harper Government in Canada wants to create Legislation similar to the Drug offenses in the US. Lets hope Canadians do not get coerced into this. Marijuana is not that bad. It has many uses medically and fewer violent crimes if any are committed because of it. Alcohol is far worse as far as crimes. Those who use Marijuana are non violent. If a police officer had a choice of going into a room with 20 Marijuana users or 20 drunk people the room with the Marijuana uses would be a much safer room. Drunk people are much more violent and much more dangerous. Marijuana users would be listening to music and eating. They don’t even bother to argue they just enjoy themselves. Drunk people fight and argue and alcohol is addictive where as Marijuana is not. So I have to say Harper’s bill is wrong on many counts. If anything Marijuana should be legalized and the Government could regulate it and make profits/taxes on it. Open stores to have it sold etc. It would eliminate grow ops and many other problems now associated with Marijuana. If individuals grew their own or buy it from a Government store there would be no need for dealers and all the other problems now faced by police at this time. Then the police could spend their time looking for dangerous criminals. It would save a lot of money and make a lot of money. End of a lot of problems. Check the link below and get some insight as to how Medical Marijuana helps people and it is safer then many Pharmaceuticals. It will even get rid of a headache. The lobby groups who want to prevent the legalization of Marijuana are the Pharmaceutical companies. Not because it is dangerous, but because it would cut into their profits. Legalizing Marijuana would create a lot of jobs something we all can agree on is needed. Maybe the drinkers would take up smoking Marijuana and make the world a safer place especially for women who are beaten by their drunken spouses. 1. The cost of the Harper crime agenda will be colossal, and a large part of it (some say most) will be borne by the provinces, who are responsible for implementing whatever the feds pass. So provinces and territories (many of them in elections as we speak) will be expected to pay for additional courts, clerks, prisons, Crown Attorneys, judges, sheriffs, court reporters and so on. And the numbers are high-$5 billion over 5 years for the one piece of legislation which was examined by the Parliamentary Budget Officer. The new drug sentences alone will increase numbers of offenders by a huge amount. The Corrections department is one of the few which is receiving huge increases in its budget as we speak. 2. Virtually all of the crime legislation is directed towards increasing punishment by way of more prison terms for more people and for longer. Virtually nothing in any of the legislation does anything to prevent crime (as the Conservatives claim), help victims (as they claim) or target guns, gangs, drugs and organized crime (as they claim). The Harper government’s stated objectives will not be met by the omnibus crime bill. 3. Other jurisdictions, notably the United States, have rejected the Harper approach. Newt Gingrich is fronting a group called Right on Crime which advocates for less incarceration. Ronald Reagan presided over a huge reduction in incarceration when he was governor of California. Maggie Thatcher refused to allow incarceration rates to rise in Britain. Many states are abolishing mandatory minimum sentences and reducing the proportion of sentences which must be served before release. 4. Canada is moving in the wrong direction, and the results will not be pretty. I predict there will be expanding deficits at all levels, an increase in misery for all parties, including offenders’ families and communities, and victims (who in fact advocate for improvements in preventive and rehabilitative programs). The picture becomes darker when you consider that up to 80 to 90 per cent of offenders in some institutions are addicts (mostly to alcohol), and up to 40 per cent have mental illnesses. A huge proportion are Aborignal people. Many offenders are homeless, illiterate, victims of sexual abuse, and so on. What is significant is that we have the means to deal with all of these conditions-we know how, and the resources required would be a fraction of the budget necessary to incarcerate so many new inmates. Dealing with these issues would not only reduce crime but would also make for a healthier community. Because the Conservatives are so concentrated on the punishment model, there will be no resources (and no inclination) to fund the programs necessary to deal with these fundamental problems. 5. Journalists continually state that the omnibus crime bill is considered necessary by the Harper government because the crime legislation was otherwise “unpassable” or because of “obstructive measures” taken by the opposition. This is demonstrably not true. The opposition never got a chance to oppose most of the crime legislation because it never came to a vote: most of the laws died on the order paper when Mr. Harper prorogued Parliament twice and when he called the 2008 election. Most of the rest of them were never brought forward in a timely manner. The Conservatives have the majority they need to pass this legislation. The only thing that might give them pause would be a public groundswell against the law. If for no other reason than financial, we should be making our voices heard. This article first appeared on Behind the Numbers. Why do you think American troops are Guarding the Poppy Fields in Afghanistan? Afghanistan went from no Heroin to tons of Heroin. Plus the US got their pipeline. Canadians do not want the American system. Check link below to see why. You also might want to check this out as well. 16. Paul Bremmer lives in Chester, Vermont, and also works in Austin, Texas. His crimes are listed at War Criminals Watch. 24. Condoleezza Rice: served as Secretary of State in Washington, D.C., and can be found frequenting shoe stores, served as a member of the White House Iraq Group (WHIG) which planned the marketing of an illegal war of aggression on the basis of lies, took part in White House meetings personally overseeing and approving torture by authorizing the use of specific torture techniques including waterboarding on specific people, lied about mushroom clouds, and was in fact a leading liar in making the false case for an illegal war of aggression. In March 2009, Rice returned to Stanford University as a political science professor and the Thomas and Barbara Stephenson Senior Fellow on Public Policy at the Hoover Institution. Consult a lawyer to avoid unnecessary risks of violating laws while enforcing the law. According to Wikipedia, “A citizen’s arrest is an arrest made by a person who is not a sworn law enforcement official. In common law jurisdictions, the practice dates back to medieval England and the English common law, when sheriffs encouraged ordinary citizens to help apprehend law breakers. Despite the title, the arresting person does not usually have to be a citizen of the country where he is acting, as they are usually designated as any person with arrest powers…. Each state with the exception of North Carolina permits citizen arrests if the commission of felony is witnessed by the arresting citizen… The application of state laws varies widely with respect to … felonies not witnessed by the arresting party. American citizens do not carry the authority or enjoy the legal protections of police, and are held to the principle of strict liability before the courts of civil- and criminal law including but not limited to any infringement of another’s rights. Though North Carolina General Statutes have no provision for citizen’s arrests, detention by private persons is permitted and apply to both civilians and police officers outside their jurisdiction. Detention, being different from an arrest in the fact that a detainee may not be transported without consent, is permitted where probable cause exists that one has committed a felony, breach of peace, physical injury to another person, or theft or destruction of property … A person who makes a citizen’s arrest could risk exposing himself to possible lawsuits or criminal charges (such as charges of impersonating police, false imprisonment, kidnapping, or wrongful arrest) if the wrong person is apprehended or a suspect’s civil rights are violated.” In the case of the war criminals we propose detaining, they are most if not all public figures and we have all witnessed their felonies, as detailed above. A civil lawsuit in Meade County surrounding a teenager who was verbally and physically assaulted brought a former Klu Klux Klan member to testify. 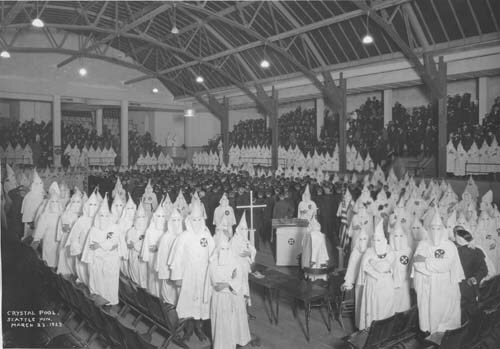 The testimony came from a former Klu Klux Klan member and included allegations the imperial wizard on trial, had a plot to kill the co-founder of a group designed to stop KKK activity. 18 year old Jordan Gruver says KKK Imperial wizard Ron Edwards and Klansman Jarrod Hensley share in the responsibility of what happened to him at Meade County Fair two years ago. Saying Hensley and members of the KKK shouted racial slurs, spit and kicked the teenager. Edwards was the man who ordered them to do so. Both Edwards and Hensley are defending themselves. Hensley entered a guilty plea to the assault and served time. They both say they don’t have enough money for a lawyer. Attorney’s for Gruver had a former KKK member testify about his past experiences with Edwards. Kelly went on to tell the jury about the plot to assassinate the founder of the southern poverty law center, the same organization that now represents the teenager in this case. Gruver is asking for six million dollars for compensation and whatever the jury wants to award for punitive damages.